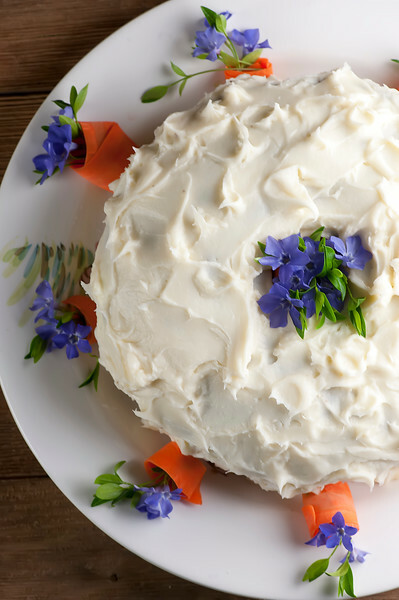 This recipe for my mama’s best carrot cake is a moist and delicious version of this classic dessert. Perfect for Easter or whenever you get a craving for this rich and wonderful treat! I can take no responsibility for that gloriousness of a carrot cake in that picture, because that is my mama’s best carrot cake. Rich and moist and frosted with a buttery cream cheese frosting that is what I imagine clouds must taste like, if clouds have a taste. We love this served on a plate painted with bunnies for Easter dessert, but I would happily eat it on any day of the year. Ready to bake up this classic treat? Let’s make it! First of all, you need a nice big bunch of these. 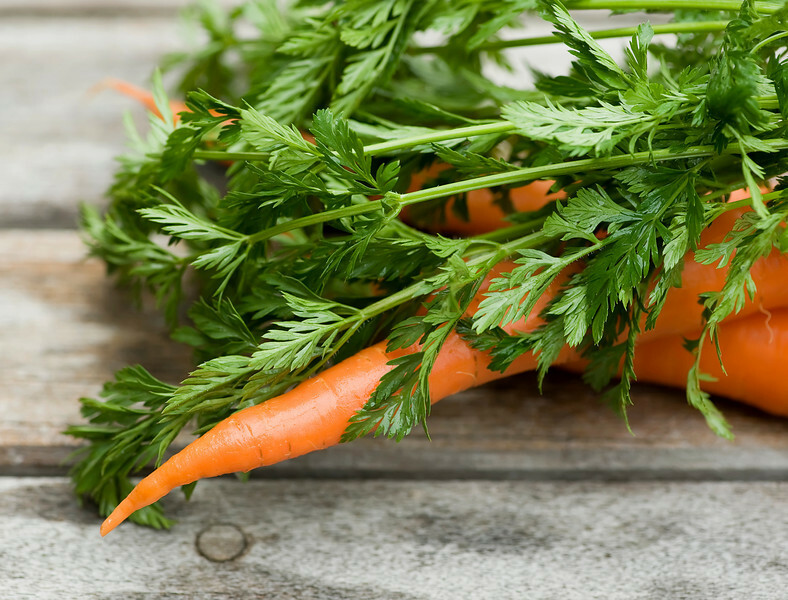 Because yes, carrot cake is full of sweet, good and good for you carrots. It’s also got pecans and raisins and cinnamon in the batter – carrot cake is basically a spice cake that is living its best life. You cook it up in a tube pan, which is one of my very favorite things to bake cakes in because tube pans come in two pieces which makes it much less stressful to get the cake out. I am all about non-stress cake. This recipe for my mama's best carrot cake is a moist and delicious version of this classic dessert. Perfect for Easter or whenever you get a craving for this rich and wonderful treat!Click to TweetOnce the cake is baked and cooled (and by the way, it’s perfectly fine to make the cake a day ahead because it keeps just beautifully) you are going to whip up a simple butter and cream cheese frosting. 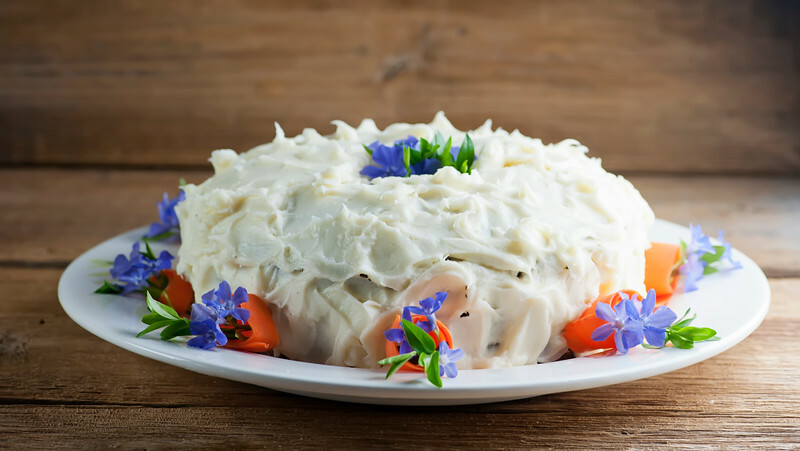 And then you are going to frost that baby, and if you are my mama, you are going to adorn the cake with little shaved curls of carrot and pretty little flowers. Which makes the whole thing that much more irresistible as it is sitting around having its picture taken. Some Southern person who shall remain nameless actually tried to swipe some of the frosting WHILE I WAS TAKING ITS PICTURE. Not only did I catch him red-handed, but I have photographic evidence of the attempted theft. Did he think I wouldn’t notice? All I can say is, my mama’s best carrot cake can do that to a person. Happy carrot cake, my friends! Preheat the oven to 350°. Butter and flour a 10-inch tube cake pan. Whisk the corn oil and sugar together in a large bowl. Sift together the flour, cinnamon, baking powder, baking soda, and salt (I do this by putting all these ingredients into a fine mesh strainer and shaking and stirring the mixture into another mixing bowl). Add half the dry ingredients into the sugar-oil mixture and mix together. Add one egg, then more of the flour mixture, then another egg and so on until you have mixed together all the eggs and flour with the sugar mixture. Stir in the carrots, pecans, and raisins, pour into the prepared tube pan and bake for 70 minutes. Cool upright in the pan on a cooling rack. When the cake is cooled, make the frosting: Using a mixer, beat the soft butter until it is creamy. Add the cream cheese and beat until blended. Add the sugar and the vanilla and mix well. (If it feels a little too soft to spread, pop it into the refrigerator until it firms up a bit). Remove the cake from the tube pan, put on your prettiest plate and frost. 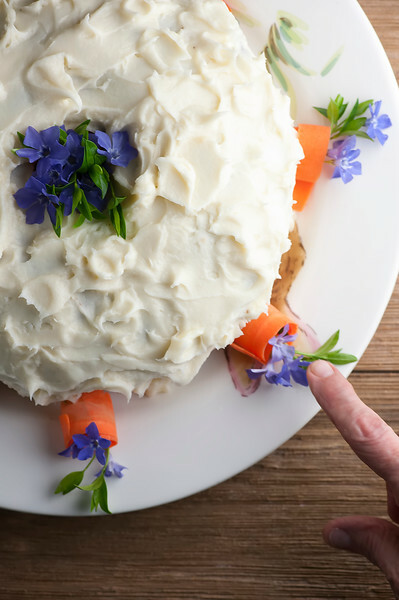 If you want to be just like my mama, garnish with shaved carrot curls and little edible flowers! LOVE the garnish. It’s so perfect and so different from what you normally see on carrot cakes – ie crushed pecans ;0) Can’t wait to try this. I’d like to make cupcakes with this recipe, any ideas on time to bake them? TIA!